On Saturday, March 24, six young women and 10 little girls competed for the titles of Miss Curwood Festival and Curwood Festival Princess in front of 180 members of the audience. 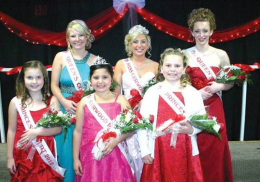 Jordyn Lawton (middle), 19 of Owosso was named Miss Curwood Festival 2012. Jordyn completed her freshman year at Grand Valley State University and is studying athletic training. She is the daughter of Ron & Shannon Lawton and is an Owosso High School graduate. Her sponsor was Windmill Pro-Paint. The 2012 Queen’s Court members are Kelsey Nations and Emily Meihls. Kelsey Nations, 19, of Owosso is currently attending Baker College. Kelsey is an Owosso High School graduate and is the daughter of Dawn Klco and Marshael Nations. Her sponsor was Civille Real Estate. Emily Meihls, 17, of Owosso is graduating from Owosso High School in June. She plans to attend UofM Flint where she will study nursing. She is the daughter of Robert & Lisa Meihls. Her sponsor was King’s Corner Market. The queen candidates enjoyed getting to know each other at an Informational Session and during a tour of Curwood Castle before enduring several rounds of interviews with two panels of judges. They were also provided with former queens and court members to mentor them through the process which culminated with on-stage questions at the pageant itself. The Queen & Court have been busy attending the Fair Queen pageant, local meetings and events, and one parade. They will be attending many events at this year’s Curwood Festival including the Kids in Curwood Country Parade, the Heritage Parade & Royalty Reception, the Mr. Owosso finale, Opening Ceremonies, Polka on Sunday, Special Day for Special Kids, Wine and Cheese, the Hospitality Party, Children’s Events, Authors in Curwood Country, as well as making appearances at other events. They will also represent the Curwood Festival and the community on the award winning Curwood Festival float at several other parades in the area through the summer months. The newly crowned 2012 Curwood Princess is Rosalin Hall. Rosalin is a nine year old third grader at Elsa Meyer Elementary School. Her parents are Martina & Tony Valdez and Les Hall. She enjoys dancing, singing, and acting. The 2012 Princess Court members are Madison Kregger and Jena Samson. Madison Kregger is a nine year old third grader at Central Elementary School. Her parents are Janena & Kevin Kregger. She enjoys swimming, softball, and quizzing. Jena Samson is an eight year old second grader at Central Elementary School. Her parents are Mike & Cory Samson. She enjoys dance, singing, and swimming. The Princess candidates were judged in the morning of the pageant, which accounts for 50% of their score. Those points are carried over to Saturday night on stage, where the remaining 50% of the possible points are added in to determine three winners. This year’s Princess and Court have been preparing for the Curwood Festival by attending the Curwood Board meeting and a parade. During Curwood Festival weekend, they will attend Opening Ceremonies, both parades, and the Royalty Reception, and they will host Children’s Events on Sunday of the festival. They will also appear in several area parades during the summer to promote the Curwood Festival. All proceeds from ticket sales of the pageant help to fund the Queen and Court scholarships. This year, scholarships were partially underwritten by Paul Davis Restoration—Matt Vondrasek and Northwestern Mutual—Len Wright. Additional in kind donors for this year’s pageant include Baker College of Owosso, Creative Catering by Dianne, Gayle Green Flowers & Owosso Floral, Schmidt Jewelers, Soundwavz, Northern Light Studio, Dave & Nina Hall, and Marr’s Furniture/Premier Rental. Gifts were graciously donated by Target Industries, Shiawassee YMCA, Mancino’s Pizza & Grinders, Powerhouse Gym, Chip’s Place, Hair Peace Salon & Spa, Courtside Café, Spagnuolo Confections, New York Style, Ashleigh’s Dance Shack, Soy Beam, Reflections Salon, Capitol Bowl, Cone Zone, Fashion Secret Boutique, NCG Cinemas, Greg Frank for Little Debbie and McDonald’s—Van Poppelen Organization. The pageant would not take place without the hard work and efforts of many committee members. This year’s Queen & Princess Pageant committee included: Sarah (Adams) Hoover, Debra (Adams) Mills, Jamie Zmitko-Somers, Kelly (Nequist) Van Poppelen, Kaylee (Dumond) Luft, Karyn (Wright) & Brian DeLorge, Sarah Snyder, Megan (Rogers) & Jeff Simms, Ashleigh Shack & Ruben Servantes, April Taute, Liz Valasek, Jessica Justice, Stephany Maniscalco, Jill McNamara, Carrie (Mowen) Miculka, Christie (Dibean) Usher, Erica Haney, Amanda (Dexter) Pirochta, Lisa Dexter, Julie (Minton) Pratt, Lee Mills, and Jason Hoover.